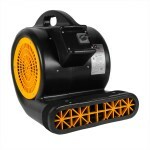 This is an air cooling drum fan that quickly moves air around a confined, or wide open area. Great for warehouses, factories, commercial, or industrial manufacturing facilities. 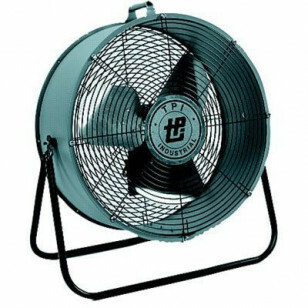 The drum fan rotates to blow cool air in any direction you need it to. If you care looking for something a little more powerful, please take a look at our complete line of barrel & drum facility cooling fans. This drum fan is colored an easily eye-catching blue color to eliminate any type of safety issues. The heavy duty steel drum is located on a sturdy frame that can be mounted or stored anywhere in your facility. The 24 inch fan moves up to 6800 CFM of air, and only pulls 2.2 amps, on its highest setting. There are 2 speed setting, a high and a low, to help you maintain those cool temperatures in your facility. Totally enclosed motor allows this blower to be used in dirty or dusty environments without worry of lessening the fans lifespan. Moves a ton of air (6800 CFM), to keep your employees cool as they work. Pulls only 2.2 amps, so 6 fans can safely be run off the same 15 amp standard circuit. Durable steel frame helps to eliminate any extra noise due to vibrations. Large aluminum fan blades maximize air flow with greater efficiency and cooling. Drum style fan rotates to direct air in the direction you need it. This is a review for the 24 inch Air Cooling Drum Fan.